Oxidized starch is the finest and best thickener for soft bodied gels requiring exceptional clearness. The soluble starch of oxidized starch can be kept for long term storage, making it suitable for canning and confectionery products. Oxidized starch is also widely used in the paper and textile industry.Oxidised starch we export is one of the most common modified starches in surface sizing because of its good film forming characteristic and reduced tendency to retro-gradation. It improves quality of paper and cardboard on the basis of primary and secondary semi-finished products. 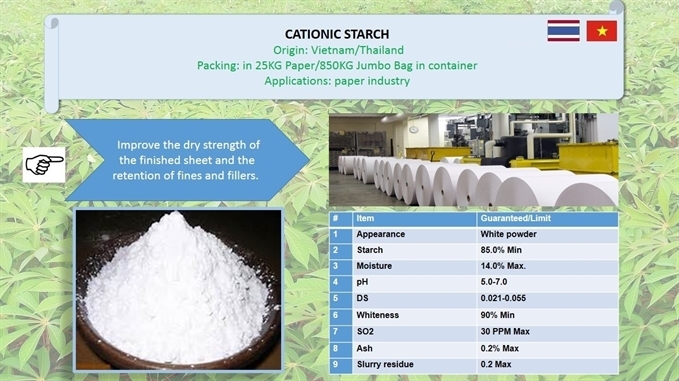 Cationic Starch is to improve the dry strength of the finished sheet and the retention of fines and fillers. Cationic starch is a fibre retaining and optical brightening agent. It increases the paper sheet strength. This starch helps in enhancing the paper strength, water drainage, retention, improve paper quality, reduced dusting, lining and size addition. This also help in greater control of paper making process hence less paper web breaks and improve paper machine functionality as well as productivity. Cationic starch also allowed using more filler and more recycled fibres thus reducing the furnishing cost. 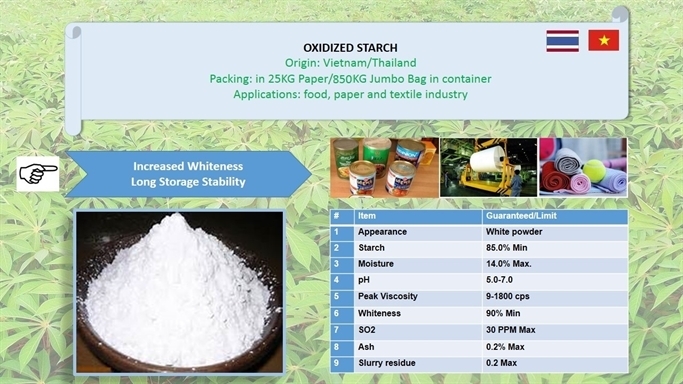 As a surface size agent, cationic starch improves stiffness, opacity, printing quality and brightness. 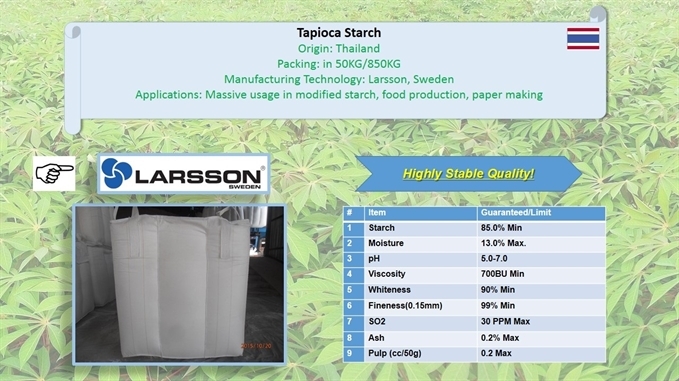 We offer quality industrial grade native tapioca starch made with Technologies from Larsson Sweden for mega paper mills, super high consistency and stability. We ship in 850KG jumbo bag or 50KG PP/PE bag on client request. Best solution for paper making industry. Meantime, we are also providing modified starch together with native starch as total solution to paper clients.